It is with profound sadness that we announce the passing of Beverly Ann Fawcett, aged 65 years of Parkbeg, SK on Thursday, November 8th, 2018 after a courageous battle with cancer. Bev grew up in the Chaplin district. 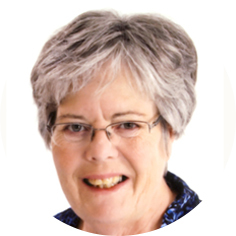 Bev had a Business Administration degree from STI and a Local Government Administration diploma from U of R. Bev worked at St. Andrew’s United Church for several years, then went to the United Church Conference Office in Regina for 17 years. She was predeceased by her father, Douglas Hughes (1996); mother, Marlene (2015); and in-laws, Percy (1988) and Dorothy (2017) Fawcett. Bev is survived by her husband of 45 years, Gary Fawcett; loving mother to daughter, Tanya Dalgarno and son, Wade Fawcett; amazing granny to grandsons, Douglas and Daniel Dalgarno; brothers, Stuart (Denise) Hughes and Randy (Tracy) Hughes; sister, Connie (Roger) Hope; sisters-in-law, Teresa (Cliff) Stevenson and Brenda (Lorne) Hamilton; twelve nieces and nephews, fifteen great-nieces and nephews, and one great-great-niece; as well as several aunts, uncles, cousins and friends. Bev enjoyed reading, gardening and flowers, curling, her community and her church. Family and friends were very important and special to Bev and we will miss her. We deeply appreciate the wonderful care that Bev received from Dr. Martin and Pioneer Lodge and will never forget it. The Funeral Service will be held on Saturday, November 17th, 2018 at 2:00 p.m. in Moose Jaw Funeral Home. Reverend Jim Tenford will officiate and interment will take place at a later date in Chaplin, SK. In lieu of flowers, donations in Bev’s name may be made to the Allan Blair Cancer Centre, 4101 Dewdney Avenue, Regina, SK S4T 7T1. Arrangements are entrusted to Moose Jaw Funeral Home, 268 Mulberry Lane. Gary McDowell, Funeral Director 306-693-4550. Another part of this old farm family gone, wishing strength to Gary, Tanya, Wade & family. May you inherit some of Bev’s strength. We were so shocked and deeply saddened to hear of Bev’s passing. I loved working with her at St. Andrew’s Church. She was such a wonderful, kind, caring, gentle, peaceful voiced lady. We had quite a few interesting stories of our time working together. She was had such a calming effect when exciting events happened. I am sure she will be missed by all who knew her. Rest in peace dear Bev. Big HUGS to all of her family. Gary, Tanya and Wade, we are so sorry to hear about Bev. In the years since we left the farm, we’ve talked many times about missing our coffee times with Bev and Gary. Bev was always so happy and upbeat, and we couldn’t have asked for a better neighbor. We are praying for you guys, and we do wish we could be there for you at this sad time ! Gary and family….we are so sorry for your loss. Our thoughts are with you all at this very sad time. Gary and family, I was so shocked to learn of Bev’s passing. Although we hadn’t been in touch for a very long time, I will miss her. She was a friend to many and know that there will be many special memories to cherish. You are in my thoughts and prayers. With sincere condolences. You are all in our thoughts and prayers at this sad time. I am so very sad to hear of Bev’s passing. Bev was a grade under me in school and we went to Co-op school together inGravelbourg when we were young. Always enjoyed a chat with Bev. a beautiful person inside out and will surely be missed by all. Our condolences to Gary and family. Very sorry to hear this about Bev. I worked with her for a few years at the Saskatchewan Conference office when she first started working there. I remember well her generous sense of humour and her ready smile. And her kindness. Much care and sympathy to all who hold Bev especially close. Very saddened to hear about Bev’s passing. We enjoyed our summer visits to the family farm. Condolences from the Day Family. Very sad to hear of Bev’s passing. Deepest condolences to the family. and Bev would graciously fulfill our needs. She will be dearly missed and I send my love as you face the days ahead without her. Grace and peace.